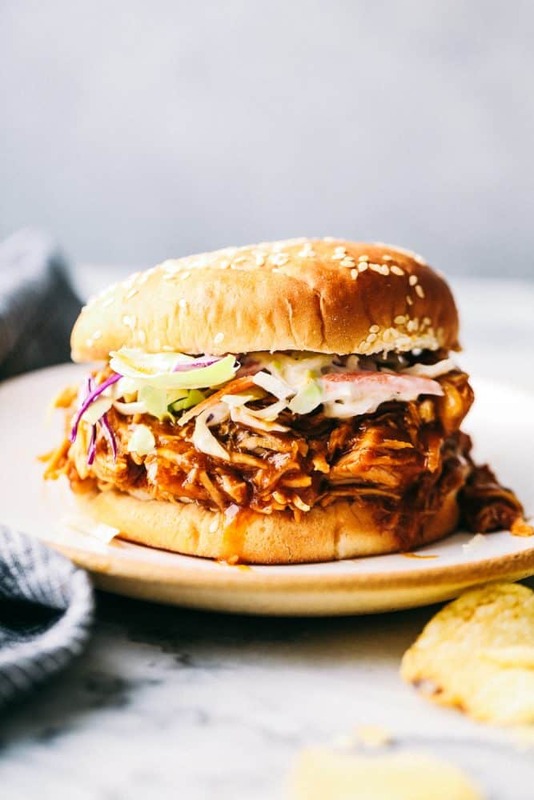 Slow Cooker BBQ Chicken slow cooks to perfection in the best sweet and tangy homemade BBQ sauce. The chicken is so tender and just melts in your mouth with the most amazing flavor! This is a great way to kick off spring and get into summer time with this BBQ Chicken. Moist, juicy chicken is versatile and makes several different meals in one! 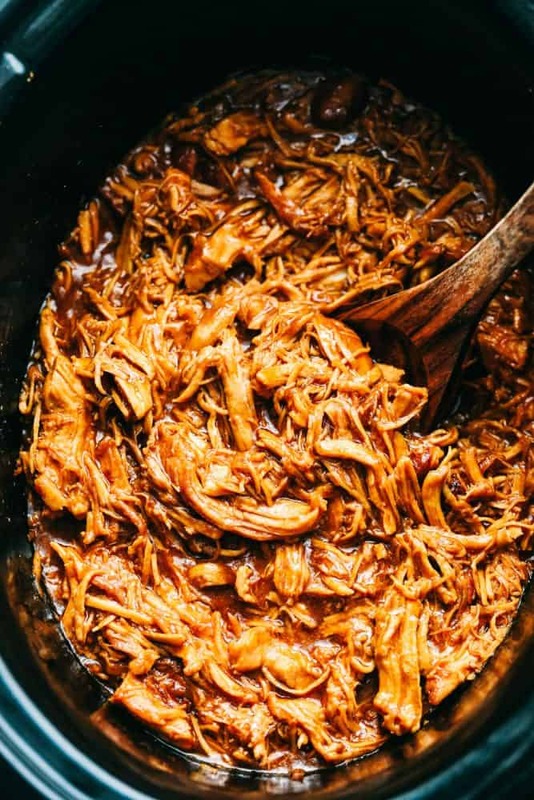 Slow Cooker Mississippi Pork Roast, Slow Cooker Honey Soy Chicken or Slow Cooker Pork Carnitas are great slow cooker meals to try! You guys!! This is seriously Melt in Your Mouth Good! There were so many “MMMM” and “AHHH” at our dinner table that no other words were spoken until half way through the meal. My boys and hubby were in complete heaven! I got a few giggles out of them once they noticed bbq sauce on each others lips and cheeks from going to town with the sandwich and not stopping. haha. It was one of those moments you laugh and want to remember that moment. My girls were enjoying it and licking their fingers after every bite. Everyone was happy and so was this mama! 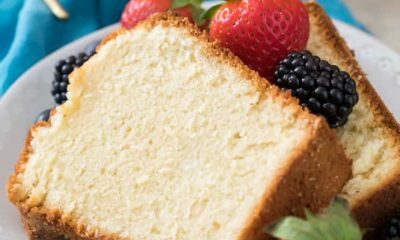 It is a simple recipe that we can’t get enough of! It makes enough to even have left overs. The sauce is thick and flavorful! One bowl to mix it all together, poor on top of chicken and let the slow cooker finish the rest. Your home will be filled with a sweet bbq smell that is mouth watering in itself. 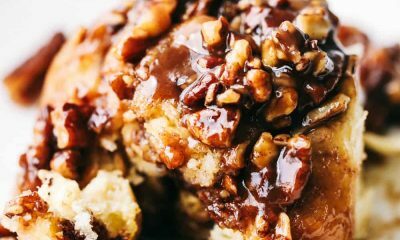 This is one recipe that your family will be begging for. 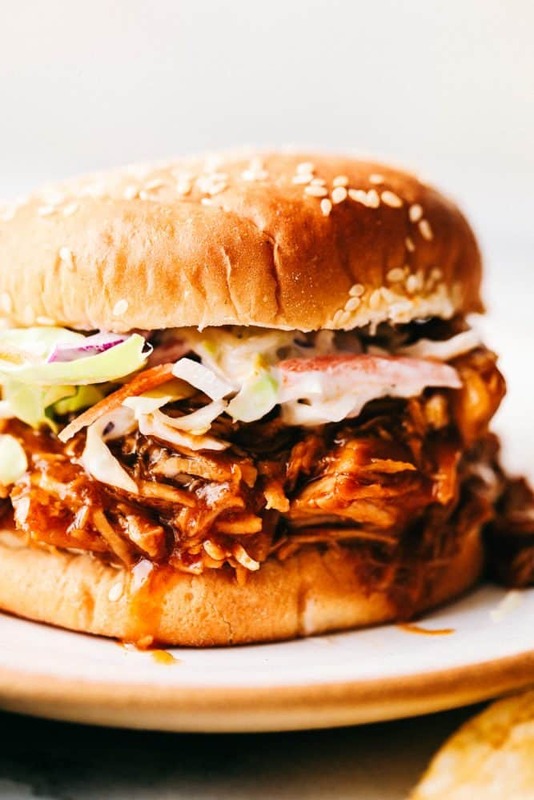 How Do You Make Slow Cooker BBQ Chicken? Add the chicken to the bottom of your slow cooker. 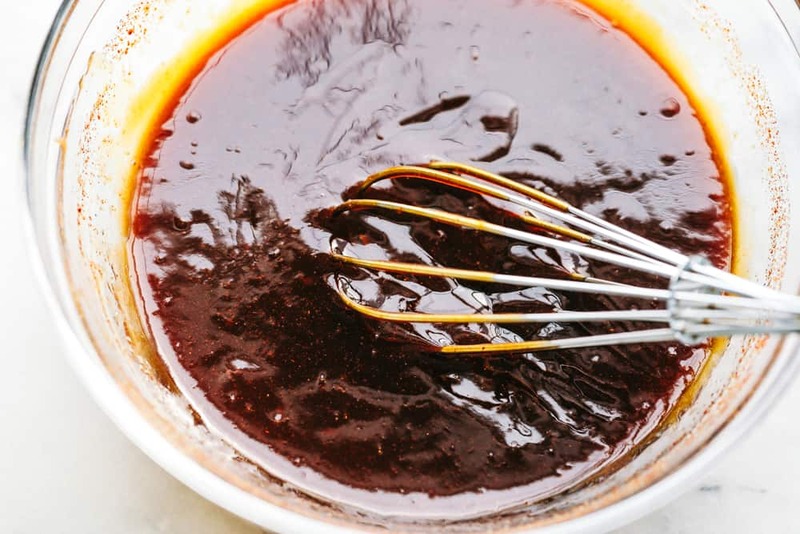 In a medium sized bowl, whisk together the ketchup, molasses, brown sugar, cider vinegar, Worcestershire sauce, paprika, chili powder, onion powder, salt and liquid smoke. Pour the sauce on top of the chicken and cook on low for 4-6 hours or high for 3-4 until chicken is tender enough to shred. Shred the chicken and mix water with cornstarch. Add to the bbq sauce and let the sauce thicken up for about 30 more minutes. How Do You Shred Cooked Chicken? Remove from pot and let cool for a few minutes. Once chicken is cool enough to handle, use two forks and pull breasts apart. If you want smaller pieces of shredded chicken, you can shred the larger chunks with your hands. Can You Over Cook Chicken in the Slow Cooker? Cooking anything really lean for a long time can result in super dry meat. Chicken breasts have little fat and little connective issue. The same goes for a lean beef roast. You can do chicken breasts in a crock pot – just not all day, more like a few hours on low. Can You Put Frozen Chicken in the Slow Cooker? It is not recommended but it will work for this recipe. Add another hour onto the cooking time for frozen chicken. How to Defrost Chicken Properly? You’ll need to change the water every 30 minutes to ensure that it stays sufficiently cold. Using this thawing method, small packages of frozen meat or poultry (about a pound) can defrost in one hour or less. For larger items, you should estimate about 30 minutes of defrosting time per pound of food. 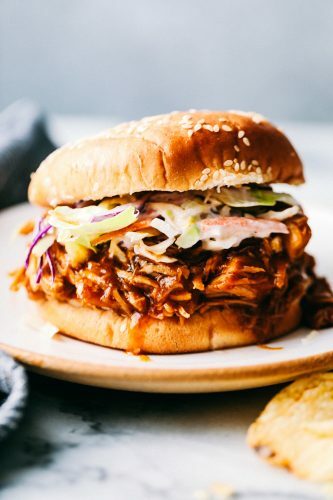 What Ways Can You Use BBQ Chicken? Can You Freeze BBQ Chicken? Yes! We like to shred the chicken instead of leaving it in whole pieces because the smaller pieces thaw more quickly. We freeze the shredded chicken in one cup portions and label the package. This will freeze well up to 3 months. What Sides Go With BBQ Chicken? 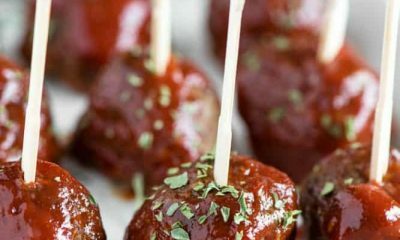 Are You Looking For More BBQ Recipes? Here are some! 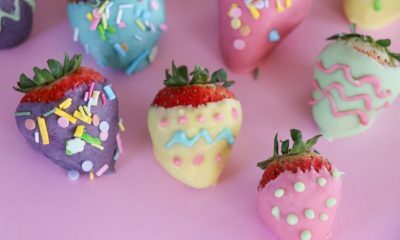 Healthier Easter Eggs Just 69 Calories! 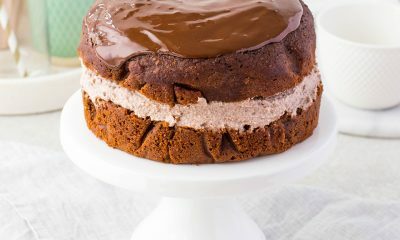 Enjoy these chocolate treats without the guilt!